The boy is still having trouser issues. It’s complicated to explain but basically often he cannot get dressed because NONE OF HIS TROUSERS ARE RIGHT. Apparently the ones Father Christmas got him are ok, but sometimes terrible parents put them in the wash. We don’t have a dryer, it’s December January*, that means at least a whole day without them. I found an old favourite pair of his jeans on the mending pile (put there by him). They were worn through in one knee. I ironed interfacing on the back of the thin area and darned them by hand because you can’t get a sewing machine into jean legs. He wore them, success. They then started falling apart some more as the fabric is just disintegrating. Boo, hiss. Then I saw this on pinterest. 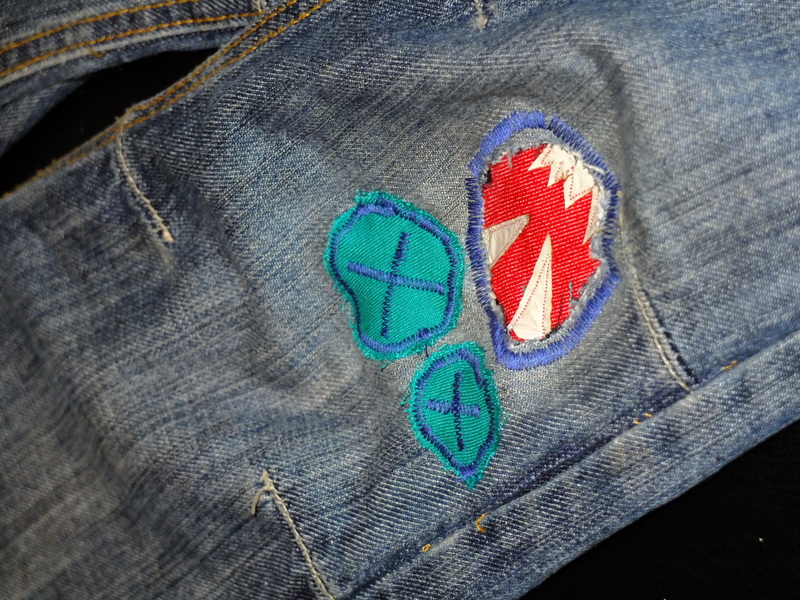 Patch jeans to look like monsters, very cute. But the genius idea. YOU CAN UNPICK THE SEAM AND MEND THEM ON THE MACHINE. Why did I not think of that? Hooray for my box of ridiculously small scraps which contained a small amount of red denim. 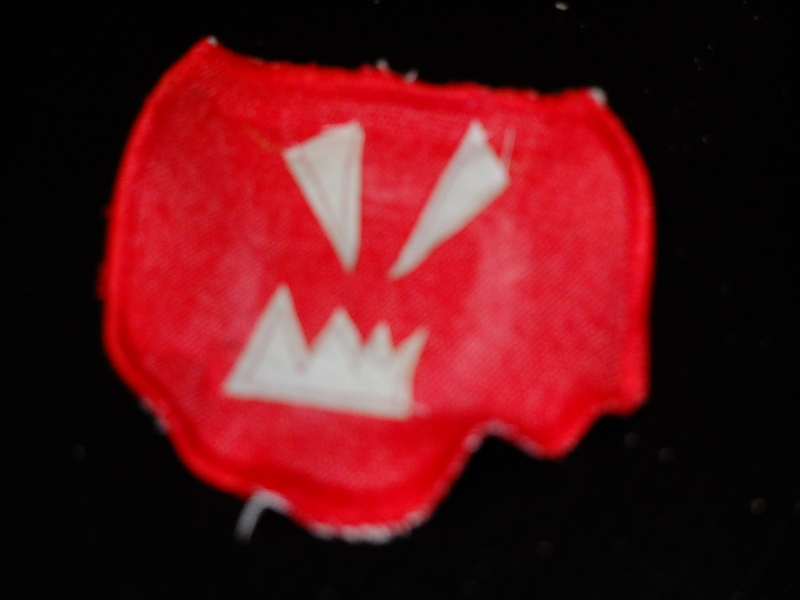 I used the reverse side of a disintigrated waterproof cycling jacket which was mainly white for the teeth (chosen as it’s non fray, I don’t suppose it’ll last that well) and sewed it on with a small stitch. I couldn’t be bothered forgot to change the bottom thread so my white stitching shows a lot of red, mini grr. My design is very similar to the link above, but hey, they blogged it, so I’m pretty sure that’s fair game ;). 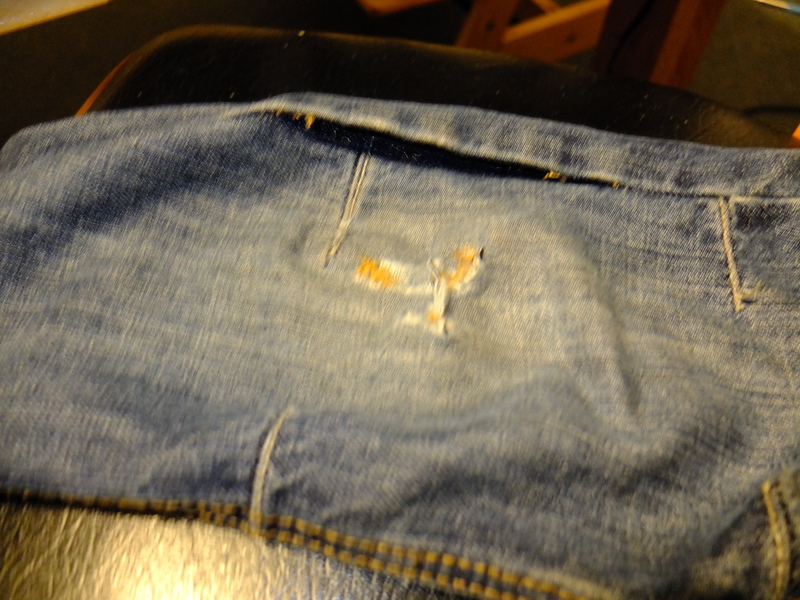 Anyway, the repaired jeans look great. I’m a bit worried that my restitched seams are no where near as beefy as the stitching I took out (my machine doesn’t take thread that thick) but hey, they were deemed unwearable as they were, so this should get some more life out of them and hopefully make them a bit more interesting (one of the problem with trousers is their plain colours apparently). Now to wash them (ahem, yes, I took them out of the washing basket to mend, I was so inspired to try this) and see if they’re deemed acceptable. This entry was posted in Uncategorized and tagged boy, child, jean, knee, mend, monster. Bookmark the permalink. I love the way your children subtly direct you to fulfil their needs 😉 and I also think this is a fantastic idea for making trousers last a little longer. Philippa, the Boy is not subtle in his direction! I have to make sure I sew things for him when he’s not around otherwise he thinks of 17 complicated changes that he wants me to do. He even started putting socks (cheap, cotton/lycra shop bought ones) on my mending pile and then complaining I hadn’t sorted them out yet. So I darned 1 sock and made him wear it so he could find out how uncomfortable it was and then he let me throw his holey socks away.